Here's another quick recipe for my college friends who live in a dorm. It's perfect for a quick breakfast if you overslept and you don't have time to grab breakfast before class. It's also really cheap and ready in a snap. The only kitchen equipment you'll need (besides a microwave) is a knife, 2 bowls and a spoon. Easy, right? It's definitely a much more healthy breakfast option than the usual junk food and it tastes about a MILLION times better than cold leftover pizza. It's the perfect fuel to fill you up and give you a great start for a long day of classes. Try it! 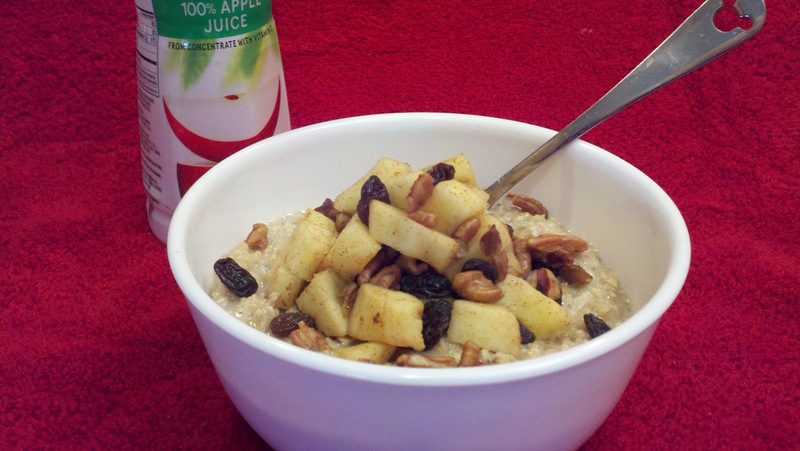 In a small bowl, combine raisins, apple, nuts, and water. Sprinkle with cinnamon and sugar and microwave three minutes. Cooking time may vary. Fruit must be cooked soft, but not mushy. Cook in 30 second intervals until the right texture is achieved. Prepare oatmeal according to package directions. Top with fruit and nut mixture. Obviously, the amounts are to suit your taste. If you like a lot of something, add a lot! Just throw in a handful of this and a handful of that, as much as you like! You can take a quick shortcut and use a handful of granola instead of the fruits and nuts. Btw, this topping goes GREAT with a big scoop of vanilla ice cream. Kind of reminds me of a warm apple pie...Just sayin!